When I moved into my new shop I needed a place to store my lumber. It seemed as though the piece I wanted was always on the bottom of the stack so I made room for more “stacks” with fewer pieces in each. I lost a little bit of space but boy is it ever easier to get at the piece I need. Nice. How long is the storage area? The main portion shown is 8 feet between supports with an additional two supports over the window for longer pieces. Can go an additional 2 feet on those top two shelves. Well done. I use a much smaller version in my much smaller “shop” (pieces of the garage my wife cedes to me for various and sundry woodworking stuff). Looks like a good project, I need to build one to mount up high soon. I may end up with vertical storage because that would let me utilize more otherwise wasted space. I sure love the look of a horizontal wood stack though. thanks. It has worked well thus far and I am happy with the way it turned out. I know several folks that use the vertical method and most seem to like it although have told me it is a lot easier for some shorter pieces to get lost in the piles. I trust you have plenty of ceiling height to stack long pieces upright? Looks good. 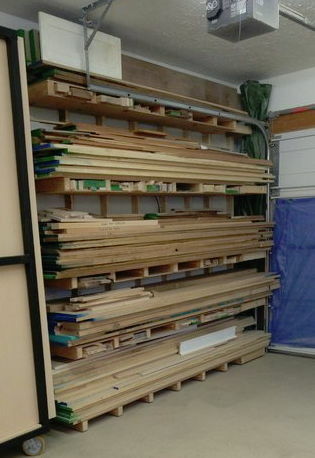 I built one very much like it a couple years ago, although I opted for fewer shelves, and I tied them together with ply, top and bottom, for some added strength and storage between the struts for short offcuts. 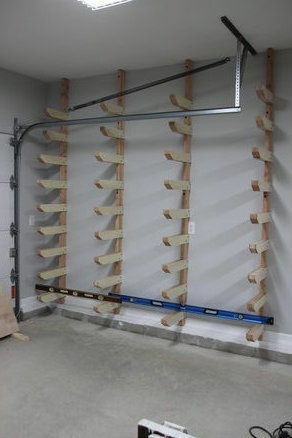 I tend to devote each shelf to a species (maple, oak, cherry, ...) Each shelf can store about 150 bd. ft. But each of our circumstances differ. I tend to do kitchens and larger projects, and my wholesale supplier is 300 Km (~185 mi.) away, so I like to stock up to reduce my transportation costs.